Information and Communication Technology (ICT) is regarded as a driver and enabler of economic development is most countries including Uganda. The study examined the extent of adoption and usage of ICT on one hundred and ten firms in Uganda; and established benchmarks that can be utilized in future research and comparison between firms. The results revealed that the adoption and usage of ICT by firms in developing countries follow the same pattern as in developed countries, and they only differ in the level of usage and adoption. Firms do appreciate the contribution of ICT to their performance, but there are various barriers which require governments to adopt appropriate policies to address them. The adoption and usage of Information and Communication Technology (ICT) is changing business processes, and the way people live and work. New innovations as a result of ICT are continuing to emerge. Globally, in the year 2000, 539 million computers were being used with 410 million in USA, European Union and Asia, leaving 129 million in developing countries. The number of computer usage was projected to grow to one billion by the year 2005. Similarly, the Internet users were 315 million in 2000, and the number was estimated to grow to 716 million users by 2005, and the majority of these users were in developed countries (Ngplains 2002). The Internet usage rate in the developed world was 8 times that of the developing countries, and there were 22 million Internet users in Africa by 2004 (ITU 2004). ICT has introduced what is known as the 'Networked economy', where successful businesses are linked with their suppliers, internal manufacturing processes, shippers and customers in real-time. Businesses are now able to move data and communicate with each other in real time. This has transformed the way businesses are being done. ICT has the capacity to cut costs of coordination, communication and information processing and many businesses have taken advantage of this (Brynjolfsson and Hitt 2000). Uganda developed an ICT policy where it regards ICT as a driver and enabler of economic development. This paper is based on a study that was carried out in Uganda with the objective of examining the adoption and usage of ICT in the firms sector, with a focus on computers and the Internet. Specifically, to provide a benchmark that can be used in future research; information which can be used for comparison between firms; and information that can be used by policy makers to support the ICT sector. The paper starts by discussing ICT in Uganda's context; followed by a discussion of the data and methodology, results and lastly the conclusion. As a result of good policies undertaken by the government, among which are the trade liberalization, privatization, civil service reform, financial sector reform, decentralization among many others in the last decade, Uganda has had an impressive economic performance with an average GDP growth of about 6% per annum. In 1996, as part of ICT policy reform process, the government liberalized the telecommunication sector and opened it for competition by licensing multiple players. There are now several cellular and mobile telephone networks, mobile radio communication, paging services, courier services, private radio and television stations, multi-purpose community tele-centres providing communication services of fax, telephone, e-mail and Internet, media services, computer services to name a few. By 1996, Uganda's telephone density was as low as 0.25 lines per 100 people, and Kampala City had 2.8 lines per 100 people. The telephone density rose to 2.5 lines per 100 people by 2003 and to 6.5 lines per 100 people by 2006. The number of Internet Service providers increased from 2 in 1996 to 17 in 2006 (Uganda Communication Commission, 2005). By end of 2003, the Internet usage was 0.5 per 100 people, which is 125 Internet users (ITU 2004). The 2003 survey was based on the information from the Uganda Business Register 2001/02 that indicated that, there were 160,883 businesses in Uganda with 87% of these businesses falling under the informal sector that is employing less than five people, and the remaining 13% in the formal sector. Uganda like other developing countries, ICT usage is still at an infancy stage, in spite of Government's effort to promote it. A sample of 143 firms was purposively selected from a list of the topmost tax paying businesses in the year 2002, as they were most likely to have invested in ICT. The choice of the population was based on the fact that the diffusion of ICT and the adoption of advanced technology are associated with higher labour productivity, higher export intensity, and large size of firms, (Batelsman et al 1996; Baldwin and Deverty 1995; Gretton et al 2002). And in Uganda's case, the topmost tax paying firms were falling under this category. The questionnaire was pre-tested and revised accordingly. The questionnaire included both open-ended questions and pre-coded questions in seven sections. The sections included: general information, computer usage, investment in ICT, IT department, Internet usage, ICT and firm performance, and information on how government can promote the adoption and usage of ICT. The questionnaires were administered and data was collected from 110 firms. The largest coverage was in Manufacturing (35%), followed by Wholesale and Retail trade (31%) Finance and Insurance 10%), Real estate and Business services (9%), Transport and Communication (8%), Construction (3%), Utilities (3%) and Hotel, Bars and Restaurants (1%). The data was then analyzed using Stata. The analysis covered general characteristics, ICT usage, E-commerce, Internet usage and connectivity, perception on the contribution of ICT to the firm, government policies, and barriers to ICT access and usage. The general characteristics covered age and ownership by firm size (see Table 1). The majority of the medium firms were foreign owned, while the large firms were mainly locally and jointly owned. When one considers firm age and ownership, 33 percent of foreign firms and 8 percent of the local firms were less than 10 years old; 27 percent of the foreign firms, 15 percent of the local firms and 17 percent of the joint venture firms were between 10 and 20 years old; 40 percent of the foreign firms, 77 percent of the local firms and 83 percent of the joint venture firms were more than 20 years old. All the firms covered in the survey had computers and Internet access, though only 62 percent had a web presence on the Internet. This is an indication that size, age together with ownership is not discriminating factors in acquiring ICT in Uganda. A finding consistent with Dunne (1994), that young and old firms adopts ICT at more or less the same rate. While all these firms had access to ICT, it had been acquired at different times. Table 2 presents the distribution of ICT usage and firm size. There is significant relationship (p-value = 0.005) between firm size and the duration of computer usage, which is in line with studies carried out elsewhere (OECD 2003; Gretton et al. 2002). The small firms are faced with limitation of investment capital, tend to be risk averse and conscious of uncertainties, and are more responsive to taxation. The results indicate that most small firms started adopting ICT in the last three years when the government started dropping some taxes. The findings above are in agreement with other studies (for example Baldwin and Diverty 1995; Baltelsman et al 1996; Gretton et al 2002) that established that the adoption of ICT increases with firm size; and larger firms tend to adopt ICT earlier than the smaller firms. As for the Internet, there is also significant relationship (p-value = 0. 012) between firm size and the duration of Internet usage. This is in line with some studies (OECD, 2003; Knight and Pollard, 2004) that have established that larger firms due to their capability to have skilled managers and workforce, advanced business practices are more likely to adopt the Internet more quickly than other firms. Table 3 illustrate the distribution of ICT usage by the age of the firm. The table indicates that older firms tend to acquire ICT earlier than other categories of firms. Further analysis indicate that there is significant relationship between firm age and duration of computer and Internet usage (p-value = 0. 00 for computer, p-value = 0.06 for Internet). With respect to ownership, all the foreign and joint venture firms had computers for more than 5 years, while for the Internet 80 percent of foreign firms and 83 percent of the joint ventures had it for between 3 and 5 years. While firms with local ownership, 76 percent had computers and 7 percent had the Internet for more than 5 years, 15 percent and 38 percent, respectively between 3 and 5 years. Eight percent had computers and 54 percent had the Internet for less than 3 years. There is a strong significant relationship (p-value = 0.000) between ownership of the firm and the duration the institution has been using the Internet, but no significant relationship (p-value = 0.256) when it comes to computers. The findings are in line with studies carried out in other countries such as OECD (2003), that have established that foreign owned firms tend to adopt the Internet faster than local firms due to a number of reasons that include appreciation of the benefits of the Internet, and familiarity with the technology among others. 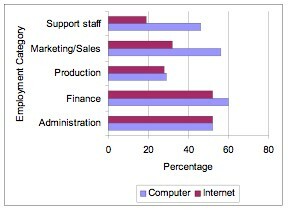 Figure 1 shows employee access to computers and Internet by employment category. Employees in the Administration and Finance have more access to computers and the Internet than other categories. While employees in Marketing/Sales have similar access to computers, they have less access to the Internet. The results tend to indicate that the marketing/sales employees are using the Internet to access information rather than as a business tool to support the marketing and sales functions. With respect to usage of the computers, the employees in administration and the support staff use them mainly for word processing, while those in finance for accounting and those in production, marketing/sales use them for information processing. The secondary usage for these computers is communication and the Internet. The production department uses them also for inventory control and storage optimization. The ICT access and usage by employees in these firms is very low compared to other countries such as the OECD countries where the usage is more than eighty percent. The Internet is found in all firms that were covered during the survey, although only 61 percent of them had websites. Twenty seven percent of these firms were using their own website hosts, while 73 percent were using sites managed by third parties. Surprisingly, Figure 2 shows that the majority of medium and large firms were using high speed Internet connectivity technology of wireless and leased lines which can be adequately used to connect the websites to the Internet backbone. This pattern is not very much different from other developing countries. The low percentage of own websites is a possible indication of few ICT skilled professionals who can develop, administer and maintain the websites in the country. 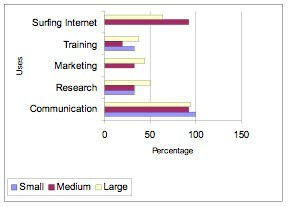 The Internet is mainly used for communication, followed by surfing as depicted in Figure 3. The websites are mainly used for marketing, with the large firms also using them as symbols of status and to provide information, as illustrated in Figure 4. The number of secure web servers provide a good indicator about the infrastructure that can support E-commerce. Secure servers allow to transmit confidential information over the Internet for the purchase of goods and services. Only 17 percent of the firms had secure servers that could be used to transact business over the Internet, but none of these firms were using them to sell goods and services by the time of the survey. There were 27 percent of the firms that were using the Internet to purchase goods and services, though the transaction values were very small. This is an indication that e-commerce hardly exists in this country, though there are some promising signs that it may be adopted by some firms in future. Figure 4 illustrates that the medium sized firms have adopted e-commerce better than the large firms, though still at a low level. The majority of medium sized firms are owned by foreigners, which emphasizes the point that foreign owned firms tend to adopt ICT faster than the local owned firms as discussed above. With respect to the contributions of ICT to the firm, Table 4 illustrates the different perceptions. The majority of respondents strongly agree that ICT provides increased savings, increased efficiency, improved service delivery, low transaction costs, and improved market performance to the organization that invests in ICT. This observation is not different from studies carried out in other countries (OECD 2003). The government has introduced a number of policies on ICT in the past seven years. There are varying responses as indicated in Table 5. With respect to whether the liberalisation of the radio and TV spectrum in the country had created an improvement in the firm's market share, only 31 percent strongly agreed, and 44 percent agreed with the statement. There was a small percentage that had not benefited from this policy. This may have to do with the nature of products and services the firms were involved in. With respect to whether the increased number of Telecom operators had reduced the firm's operating costs, 52 percent were in agreement, with 19 percent strongly agreeing, and 16 percent undecided, implying that there were firms that had really benefited from this policy. There were also some firms that had not benefited from the policy, which may be due to the nature of business they were carrying out. With respect to whether the increased number of Telecom operators and Internet service providers (ISPs) had enabled firms to invest in the Internet, 56 percent were in agreement, with 31 percent strongly agreeing, with a small number not agreeing and undecided. This is an indication that firms will easily invest in the Internet, when accessibility to the service is opened up, and there are several players in the Internet business. With respect to whether the availability of well trained ICT personnel can encourage firms to invest in ICT, 50 percent were in agreement, 28 percent strongly agreed, and 19 percent were undecided. This indicates that the availability of ICT professionals in the country is an incentive for firms to invest in ICT. The above responses do indicate that government policies are working, and firms are realizing the benefits from these policies. The study examined several barriers to ICT access and usage. Table 6 presents the percentage of respondents and their perceptions on the various barriers. While the analysis of these perceived barriers is good for policy makers, it has to be interpreted with caution, as the answers depend on the respondent, and what he/she feels about the barrier in his/her present circumstances. For instance, when the firm has been able to employ good ICT professionals, this would not be a problem, as for another firm which wants to recruit these professionals, but they cannot afford to pay them. Other than the lack of perceived benefits to the firm, the other barriers were very important, and the majority of the respondents were in agreement. Therefore, there is need for Government to formulate policies that address these barriers. The results do reveal that while the developing countries are still lagging behind the developed countries, the adoption and usage of ICT follows the same pattern in all countries. They just differ in the levels of usage. The usage of computers and Internet is high in medium and large firms, and especially firms owned by foreigners. The small firms which are mainly locally owned, have low usage due to the high cost of required investment, limited knowledge and skills, and being very responsive to taxation. The findings suggest that there is need to widen ICT training facilities for the local entrepreneurs to take advantage of opportunities associated with the adoption of ICTs; and to address taxation on the Internet services and other ICT consumables to lower the cost of acquisition. The findings further indicate that the people do appreciate the contribution of ICT to the performance of their firms, but the various barriers such as high costs of hardware, software, Internet and ICT professionals among others are an hindrance to their progress. This requires government to develop policies that are geared towards addressing these barriers and promotion of ICT adoption and usage. Note: This research was financed by the African Economic Research Consortium (AERC), Nairobi, Kenya. Baldwin, J.R. and B. Diverty (1995), Advanced Technology use in Canadian Manufacturing Establishments, Working Paper No. 85, Microeconomics Analysis Division, Statistics, Canada, Ottawa. Brynjolfsson E., Hitt L.M., 2000, Beyond Computation: Information Technology, Organisational Transformation and Business Performance, Journal of Economic Perspectives – Vol. 14, 4, pp 23-48. Dunne T. (1994), Plant and Technology usage in US manufacturing industries, RAND Journal of Economics, volume 25, pp 488-499. 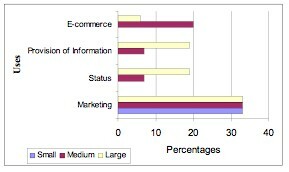 Knight J. and Pollard M (2004), 2003 E-commerce Survey of business: Information and Communication Technologies (ICT) adoption and usage. http://www.statistics.gov.uk/downloads/theme_economy/ecommerce_Nov2004.pdf , accessed October 2005.